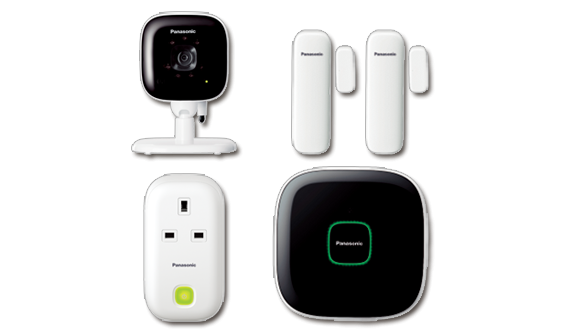 The Panasonic Smart Home solution or kit is the easiest way to get yourself familiar with home automation and security. It’s very easy to install and you don’t need to have some sort of PHD to get started. Accompanied by a phone app (Android, iOS and Windows), all you have to do is plug in a couple of cables, install the sensors, place the camera somewhere and the rest is history. The Smart Home is a home monitoring and control system with simple installation and easy operation. 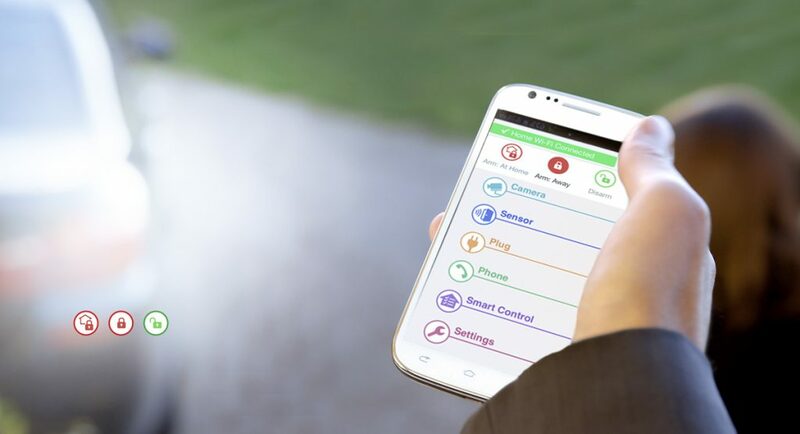 Whether you use it to monitor your home while you are away, or simply to switch your appliances on & off automatically, it gives you the ability to monitor and control your home from the convenience of your smartphone or tablet. There is no monthly subscription fee to run the system, and our wide range of optional accessories enables you to extend the system to suit your needs. The kit comes in different packages and depending on which one you opt for, you get different configuration of hardware. The version we have comes with a webcam, window sensors, a hub and a smart plug. The camera and the sensors are focused on security side of things while the smart plug is for home automation, for example I have a small electric heater attached to it so that I can remotely switch it on as I get about 10 mins away from home and that makes the room nice and crispy for when I get in. Obviously you can use it for other scenarios, such as connecting it to a lamp so you can pretend someone is home when you’re away. Talking about the security side of the Smart Home, once setup, it won’t show up on your regular WiFi scanners, thanks to its DECT ULE standard and it also means less interference, more stable and secure connectivity to the hub. The setup process Panasonic claims is very easy and very easy it was. You simply start with the hub, connect it to the internet and power, download the Panasonic Home network app and follow the instructions. What I also recommend is that you test it yourself also to ensure that it works well and it’s setup correctly before leaving your pet at home alone. The accompanying app is the control center for your Smart Home system, and it’s very simple to use. The top area let’s you quickly switch between Arm “At home”, Arm “Away” and disarm. 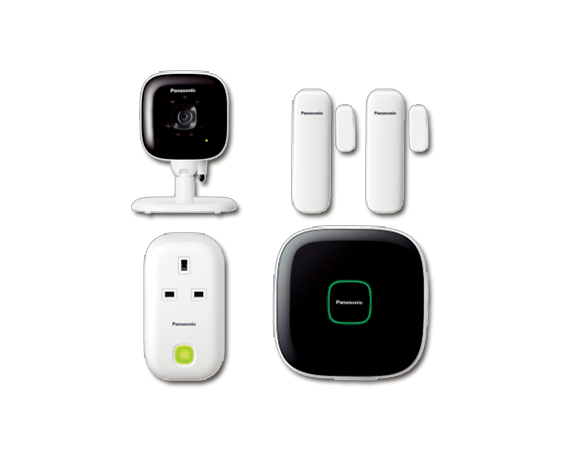 Below those icons, you have the option to dive into each components, for example in the camera menu, you can view recordings or live view, in the sensor menu you can view logs and status, in the Smart plug menu, you can activate or deactivate individual plug or group of plugs. Under each component, you can use the top right menu option to view settings, for example, tapping the menu in camera mode will give you the option to change camera resolution, which is not full HD (6fps at a 640 x 480 (VGA) resolution) and change frame rate and under smart plug you can see how much energy you are using in kWh. Although the app is incredibly easy to use, the UI is not up to par when compared to other apps optimized for iOS or Android. One really annoying thing about the app is how you have to wait after tapping any icon, you get a please wait message that pops up every time. I’ve even had times where I tried to remotely connect to the smart plug but it just timed out or crashed. Overall, the Panasonic Smart Home delivers on all of it’s features, my only qualms is with the level of quality at which the features were delivered. Having to wait each time for the app to load and connect whether remotely or even on WiFi is an issue and the App looks outdated. Once connected however, it works a treat, I can view my videos, save them (with microSD needed), and I can remotely control my smart plug. Have any questions on the Smart Home? drop a comment below or ask over on Twitter @gadgetsboy.